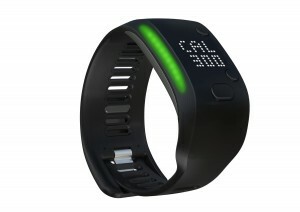 adidas announces today its newest workout training device, FIT SMART, part of the miCoach platform. 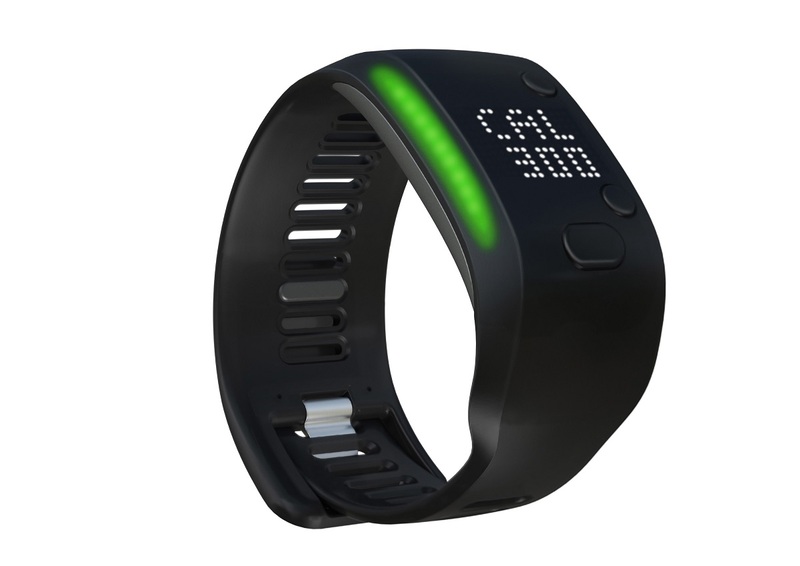 FIT SMART measures heart rate, calories, pace, distance and stride rate, all from the user’s wrist. The dev ice provides feedback to athletes of all levels by helping those set goals and encouraging them to commit to long-term fitness regimens. FIT SMART stores up to 10 hours of workout data and syncs via the miCoach Train and Run app on iOS and Android devices, which allows for customized settings and free training plans suited to each athlete. 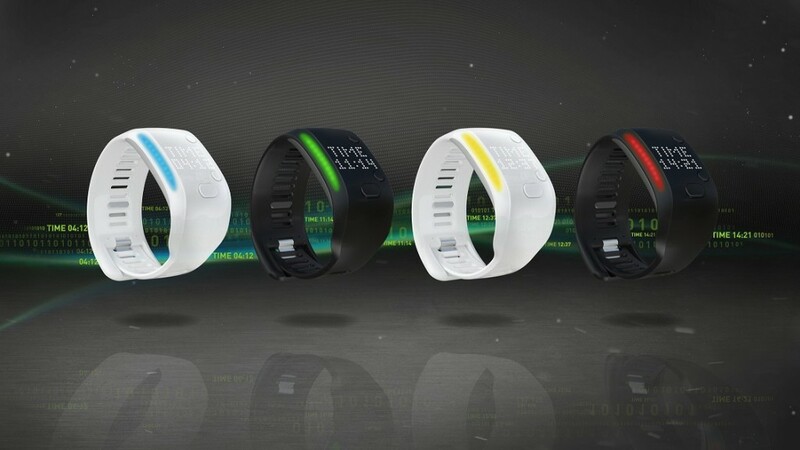 FIT SMART will retail for $199 when it goes on sale in late August, exclusively in the U.S. at Best Buy locations and BestBuy.com, with availability to follow a few weeks later at adidas.com, adidas Sport Performance stores and other leading retailers. Destiny is not fate. You have a choice. This is the World Cup Semi-Final. It’s now or never. all in or nothing. The adidas Foot ball channel brings you the world of cutting edge football. Gain exclusive access to our players, go behind the scenes with our teams and be the first to see the latest innovations in football. adidas Football’s mission is to push the limits of the game forward, driving the performances of Messi, Bale, Van Persie and Sunday League players around the world. Check out the latest video that features German stars including Thomas Müller and Mesut Özil as well as Brazil stars including Oscar. 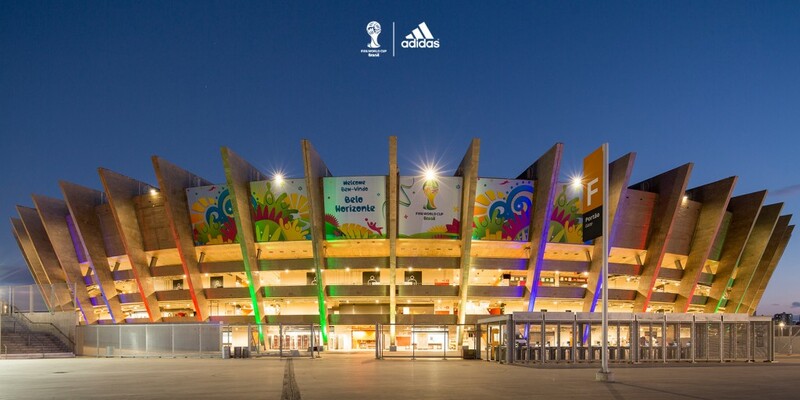 adidas and Funny or Die have actor Christopher Mintz-Plasse go on a quest to discover the best World Cup party. Filmed on location in Rio de Janeiro, and featuring cameos from adidas stars and legends including Fernando Hierro, Juan Mata, Cafu and Patrick Vieira, Mintz-Plasse is a roving reporter searching for a party with hilarious results. Along the way, Mintz-Plasse joins Fernando Hierro for the adidas miCoach Smart Ball Power Challenge, receives soccer tips from Juan Mata and trains with the Flamengo youth team, before talking Brazil and Argentina with Cafu. Feeling disappointed with not being able to find any parties, it is left to French legend Patrick Vieira to explain that the World Cup and going to a match is the biggest party of them all. Budweiser Believes That USA Will Win! When you’ve made it this far and it’s win or go home and the whole country’s skipping out of work to cheer their brains out, there’s only one other thing you need: AN EPIC HYPE FILM. 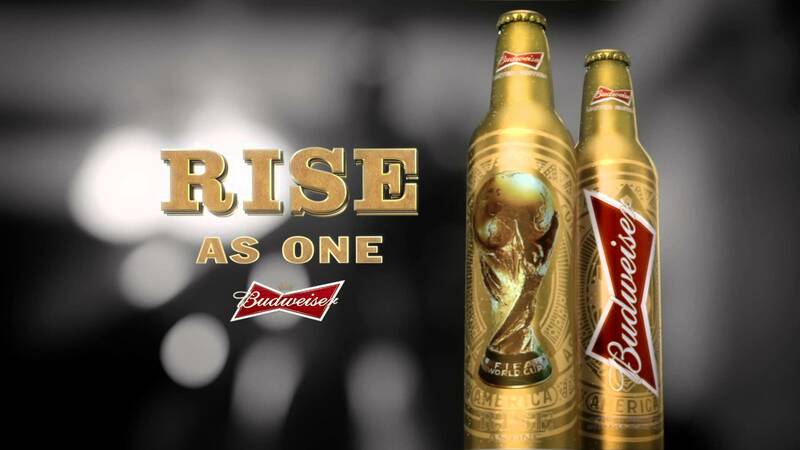 Watch the new Budweiser World Cup 2014 commercial for the USA vs Belgium round of 16 match. Let’s do this. Go USA. Hendrick Motorsports has a strong lineup of drivers. NASCAR fans know that a few of their drivers are six-time champion Jimmie Johnson, four-time champion Jeff Gordon, 2014 Daytona 500 winner and 11-time NASCAR’s most popular driver Dale Earnhardt Jr. and 16-time race winner Kasey Kahne. Most recently, Hendrick Motorsports organized a campus wide fan event and sought out die-hard fans of each of our four drivers. Hendrick Motorsports asked those fans to participate in a small video and would get a signed hat for their participation. 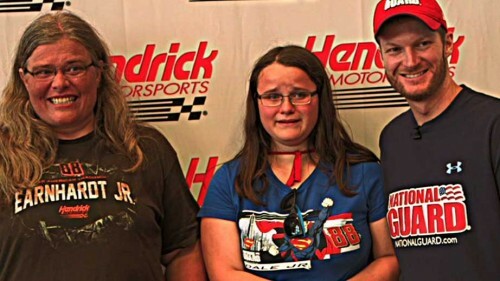 At the end of the photo shoot their favorite drivers would appear in a photo without them knowing. Watch the video to see their reactions! With summer heating up and soccer viewing parties in full swing, folks around the country will be celebrating the World Cup by having parties with family and friends. Tomorrow as the US Men’s National Team takes on Belgium I thought it might be nice to try some cool new recipes for the game. Here are some recipes by Chef Rick Bayless featuring Negra Modelo and Frontera Brand salsas, sauces and mixes. 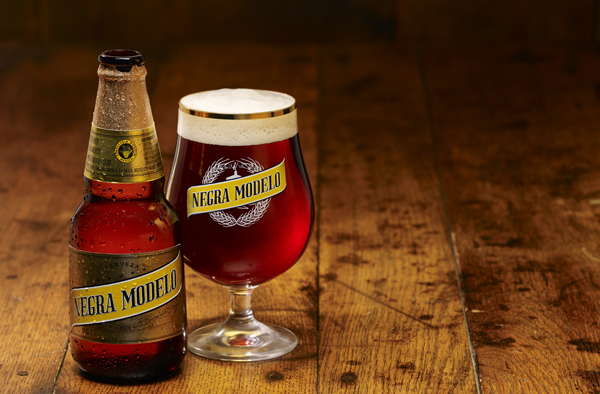 A creamy, full-flavored dark brew with a pleasant malt aroma and dry hop flavor, Negra Modelo is the perfect beer not only to enjoy on its own but to use in these great recipes while entertaining guests during summer celebrations. 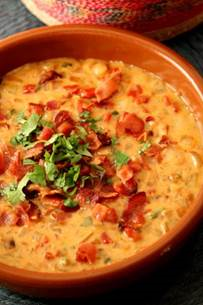 The following recipes feature a variety of dishes including Bacon & Beer Queso Fundido, Smoky Negra Modelo & Chipotle Meatballs, Bison Burgers, Grilled Skirt Steak Tacos and Frontera Guacamole. Cook bacon in an 8-inch non-stick skillet over medium heat until browned and crisp, 6 to 8 minutes. Remove bacon, cool and then crumble and set aside. Pour off all but 1 tablespoon of the drippings from the pan. Set the pan over medium-high heat and add the onion. Cook and stir until golden, about 6 minutes. Add jalapeno and sun-dried tomatoes; cook until chile softens, about 1 minute. Add beer; cook and stir until evaporated, about 2 minutes. Reduce the heat to medium-low, sprinkle the cheese evenly over the onion mixture. Stir slowly and constantly until just melted, usually 2 minutes. Immediately scoop into a warm serving dish. Sprinkle with bacon and cilantro. Serve in warm tortillas or on tortilla chips topped with salsa. Mix the ground beef, breadcrumbs, eggs, cilantro, mint, salt, oregano and black pepper together in a large bowl until well incorporated. Form the meat mixture into balls, about 1–1½ inches in diameter. Bake the meatballs about 10–15 minutes at 400° on 2 foil-lined baking sheets until nicely browned and fully cooked. Combine the salsa, beer, tomato puree, dark brown sugar and 1 teaspoon of salt in a slow cooker and turn on low. Add in all the meatballs. 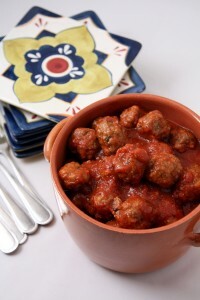 Once hot, the meatballs are ready to serve and can be held in the slow cooker on low for 3–4 hours. Serve individually with toothpicks or let guests help themselves with a spoon. Put ground bison, 1/2 of the Frontera Sauce pouch, cilantro and ½ teaspoon salt in large bowl. 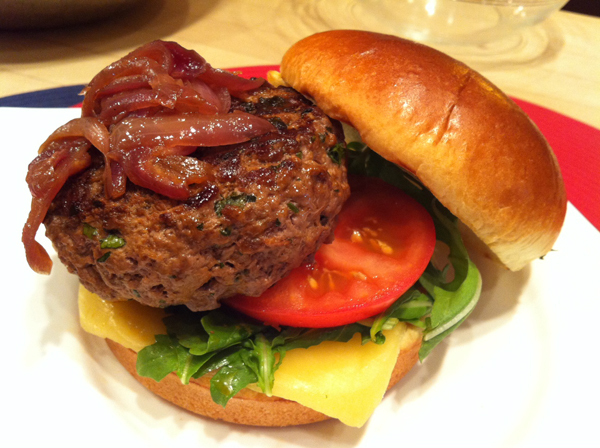 Use clean hands to gently mix, then shape into 6 burgers each about 3/4-inch thick. Refrigerate covered 30 minutes or up to several hours. Heat oil in large skillet. Add onion and cook, stirring until golden, about 5 minutes. Stir in sugar and cook until onion is nicely caramelized, 2 or 3 minutes. Stir in beer and Worcestershire; heat to a boil. Remove from heat; stir in remaining ½ of the Sauce pouch, then season with salt. Prepare a charcoal grill or heat a gas grill to medium-high. Grill burgers directly over medium-high heat for 4 minutes. Flip and grill until medium-rare, about 3 minutes more. Top each burger with a slice of cheese during the last minute of cooking. Serve on toasted buns topped with a couple of spoonsful of the onions, a tomato slice and a tuft of arugula. Cut steak into 4- or 5-inch portions. Mix 1/2 cup of the salsa, the beer, garlic, lime juice, cumin and ½ teaspoon salt in a large zippered bag. Add the steak. Close the bag tightly and turn gently to coat the steak. Refrigerate 1 hour or up to 8 hours. Heat a gas grill to medium-high or light a charcoal fire. Brush or spray the onion slices with vegetable oil. Grill onions over a cooler section of the grill, turning carefully until softened and browned, about 10 minutes. Transfer to a serving dish. Remove the steak from the marinade (discard the marinade). Oil the steak well on both sides, and lay it over the hottest part of the grill. Grill, turning once, until richly browned and done to your liking, about 1 ½ to 2 minutes per side for medium-rare. Cut skirt steak across the grain into thin strips. Mix with the onions, season with a little salt. Serve steak and onions with the remaining Frontera salsa, cilantro, lime wedges and hot tortillas, for making into soft tacos. Put beer and sun-dried tomatoes in medium-sized microwave-safe bowl. Microwave on HIGH power for 2 minutes. Remove from microwave and let sit until tomatoes are softened, about 10 minutes. Strain off beer, then coarsely chop tomatoes. Remove the stem at the top of each avocado. Cut each avocado in half by slicing straight down through that spot where the stem was attached, until you reach the pit, then rotate the knife all the way around the pit. Twist the two halves apart, then scoop out the pits. With a spoon, scoop out the soft avocado flesh from the skins, collecting it in a large bowl as you go. Coarsely mash with the spoon (or you can use an old-fashioned potato masher or large fork). Gently stir in the salsa, sun-dried tomatoes, corn and cilantro. Taste and season with salt. Scoop guacamole into a serving bowl. Garnish with cilantro sprigs. Serve with tortilla chips, slices of cucumber or slices of jicama. On Monday June 23 and Tuesday June 24, Reebok joined The Fourth Period in their official NHL Awards Gifting Suite to present top present and former NHL Players and talent with the brand new Reebok ZJET Running sneaker, now available on Reebok.com! Notable players such as LA Kings Stanley Cup Champions: Captain, Dustin Brown and Anze Kopitar took a moment to grab a pair of the new running kicks, while checking out the innovative JetFuse technology. Also in attendance at the suite was Rookie of the Year nominee, Tyler Johnson (Tampa Bay Lightning), Foundation Award nominee Brent Burns (San Jose Sharks), Patrick Marleau (San Jose Sharks), Danny Dekeyser (Detroit Red Wings), Chris Pronger (Philadelphia Flyers), and Andrew Ference (Captain, Edmonton Oilers). Former players and broadcasters Rob Ray (Buffalo Sabres), Jody Shelley (Columbus Blue Jackets), Eddie Olcyzk (Pittsburgh Penguins) and Anson Carter (NY Rangers) also received a pair of new running sneakers to keep in hockey shape. NHL Awards host George Stroumboulopoulos as well as Bones star David Boreanaz also took some time to stop by the booth. Ever since Olympic gold medal volleyball player Kerri Walsh donned the colorful kinesiology therapeutic tape on her shoulders during the Olympic Games, it has been as commonplace to see it on athletes– from gold medalists and world champions to amateurs and weekend warriors. You probably saw the US Men’s National Soccer Team wear it as they play in the World Cup. 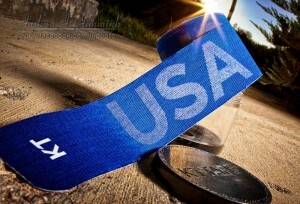 KT Tape has been chosen as The Official Kinesiology Therapeutic Tape Supplier of the U.S. Soccer Federation (USSF) through 2016. The 3-year partnership ensures that all USSF players – from its Development Academy through the U.S. Men’s National Soccer Team (USMNT) competing in the World Cup will gain support and relief for their aches and pains from KT Tape. In addition to sporting the colorful KT Tape in their ankles, calves, knees, thighs, hamstrings, necks and backs during training and competition, USMNT players will be featured in advertising, promotion and marketing for the brand. 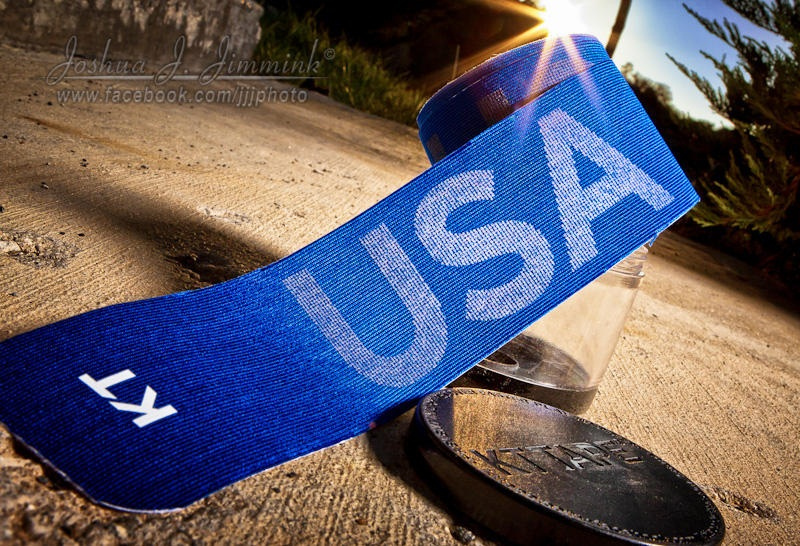 KT Tape will produce a special USSF logoed KT Tape – exclusively for USMNT players to wear during the 2014 World Cup. We had the chance to chat with the Jim Jenson the founder of KT Tape about their product. Art Eddy: What does it mean your company that you were selected by the U.S. Men’s National Soccer Team to use your tape for the World Cup? Jim Jenson: As the category leader, we are excited to serve as the official kinesiology tape for the U.S. Men’s National Team over the next three years. Since the 2008 Olympics when Kerri Walsh appeared on the sand wearing our tape, athletes from a variety of sports have been using KT Tape to help with for muscle, ligament and tendon pain relief and support. AE: How does your tape help athletes? JJ: Competitive athletes don’t like to be weighed down by anything that can slow them down or hinder their movements. KT Taps is great for these athletes because it enables them to perform their best by providing pain relief and support to sore muscles or injuries before, during, and after activity without restricting motion. AE: What about people who may not be all-star athletes. How can they get the benefits from the KT Tape? JJ: Everyone can benefit from KT Tape, from Olympians to ‘weekend warriors’. KT TAPE is lightweight, comfortable to wear, and can be used for hundreds of common injuries such as lower back pain, knee pain, shin splints, carpal tunnel syndrome, and tennis elbow. To celebrate Lionel Messi’s 27th birthday today, adidas has unveiled a special edition Battle Pack adizero F50. 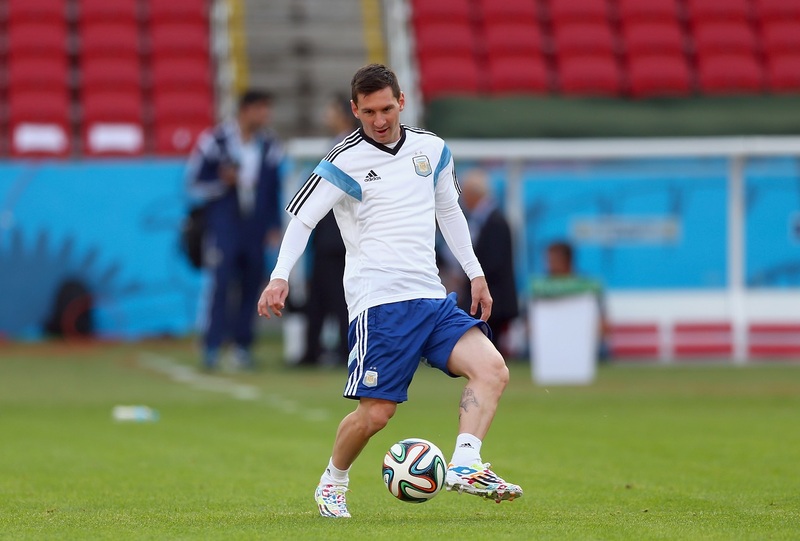 The Argentina star is scheduled to wear his birthday cleats in training today ahead of his final group match tomorrow against Nigeria. adidas made only 27 pairs of these cleats, which feature the Battle Pack design in an exclusive green, blue, pink, orange and white color scheme. 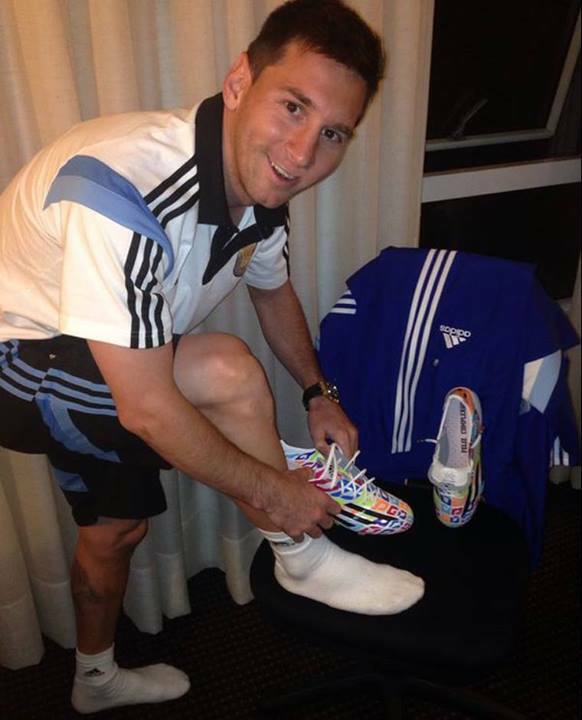 Fans can win autographed pairs of Messi’s birthday cleats today via @teammessi on Twitter. 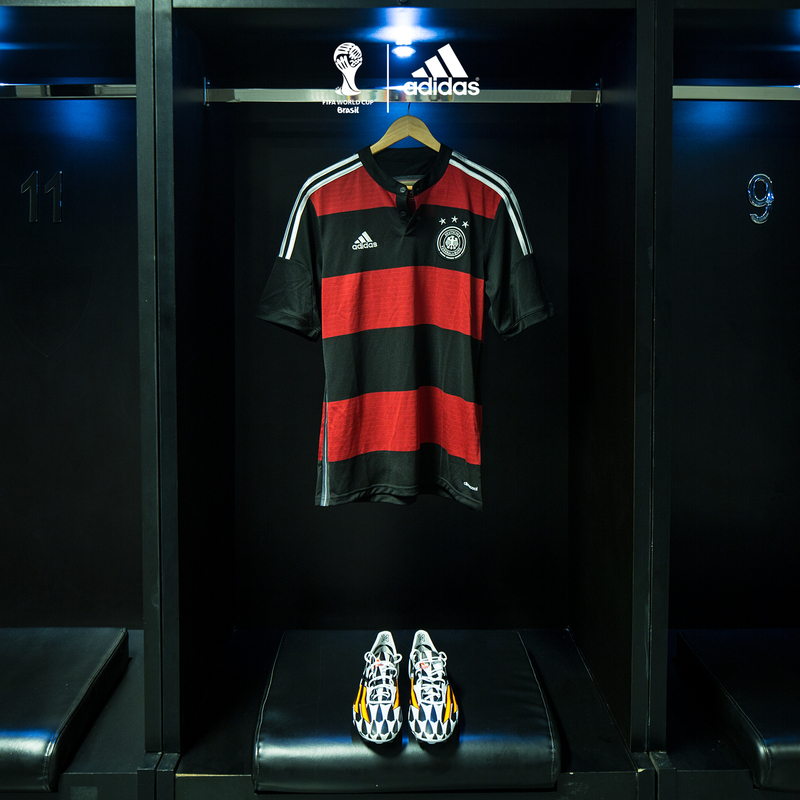 For more World Cup information visit @adidasSoccer #WorldCup #allin or nothing. 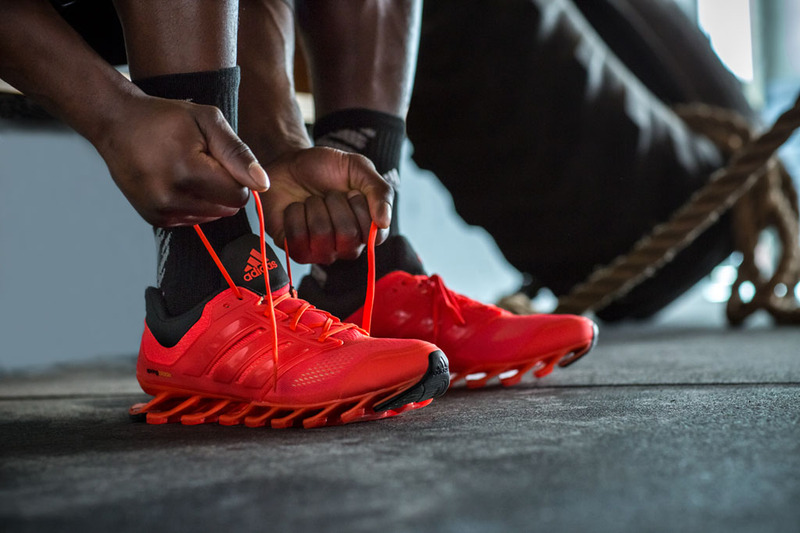 adidas launches Springblade Drive in an aggressive spot with Buffalo’s Sammy Watkins. Shot using phantom slow motion, drone helicopter and infrared cameras that detect heat, the eruptive wide receiver explodes off the turf and speeds through stadium stairs. The simplified silhouette features a 360-degree engineered air mesh upper and a suede tongue and collar for additional breathability, comfort and premium details. Inspired by the Energy Boost 2, the one-piece heel to mid-fit cage provides extra stability. The shoe’s 16 individually tuned blades instantaneously react to any environment, compressing and releasing energy. For the first time, the blades come to life through vibrant color application. Springblade Drive is available Wednesday for $180 at adidas.com, adidas Sport Performance stores and select retailers nationwide.